The smell of fresh hot cross buns warming up and that glorious sound the butter makes when it starts to melt, are just some of the many things we all enjoy about the Easter period. Our public holidays are spent with immense amounts of chocolate goodness, highly competitive egg hunts and delicious meals with all our favourite people. However, did you realise that four dangers to our furry family members were just mentioned? During this taste-bud tantalising time of the year, there are a range of hazards to our pets that we should be aware of so that the long weekend we all look forward to goes to plan. As you would know, our four-legged friends cannot eat chocolate. It is important to remember that even the slightest bit of chocolate can cause extreme harm as well as potential death. The two ingredients in chocolate being caffeine and theobromine, combined with the high fat content, are stimulants that directly affect their nervous system, heart muscle and urination frequency. The risk of toxicity increases with the darkness of the chocolate. Therefore, all chocolate should be avoided. Another danger is the foil that the chocolate is wrapped in. This will become an intestinal obstruction. It is always a hard time sharing anything chocolate related. However, when it comes to our pets, sharing is definitely not caring! So, rest assured that you can keep any Easter eggs, especially the crowd pleasers wrapped in that deep purple we all know and love, far away from our pets. While we can give our pets fresh eggs, it is important to remember that they tend to date very quickly. If your pet finds a hard boiled egg that has started to rot, they can become very unwell and you will need to take them straight to the vet. 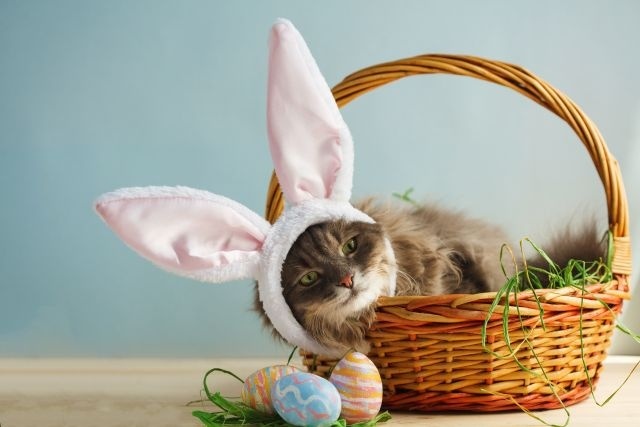 Unfortunately, all pets should not be allowed to participate in any eagerly awaited Easter egg hunts. Regardless of whether it is with chocolate or hard-boiled eggs. The family member appointed the Easter Bunny should count all the eggs before hiding them as well as after they are found. Traditional hot cross buns are usually filled with raisins, grapes and currents. If ingested, this can cause acute kidney failure in canines. Not only is kidney failure extremely painful for our dogs, it can be fatal and very expensive to try to treat. Having flowers in the house can brighten up the entire vibe of the room, however the Easter lily is one of the greatest threats to our cats. All varieties and parts of lilies will cause acute kidney failure and is often fatal. Whether your cat ingests a small amount or grooms to remove some off the pollen on their body, this will still cause the same, detrimental outcome. Therefore, the safest option for all our feline pet parents is to keep lilies out of the home. Do you want to know what looks like a tasty and appealing snack to our pets? Toys. Baby chicks, plastic eggs and all the bunny figures you can find will be attractive to your pet. These toys, sometimes quite small in size, are a choking hazard to your pet. Keep all of these objects away from our furry friends, whether this is off the ground and on a high shelf or in another room out of their reach. Alongside a treat or soft toy, Easter decorations and baskets are usually filled with artificial grass. This makes a very tempting toy for our fascinated felines. If swallowed, your pet may need to have surgery to remove it from their intestinal tract as it can become a linear foreign body. The object must be removed as it may cause your pet to become extremely unwell as well can be fatal. There are usually leftovers from all our delicious meals over the Easter holiday period. Including a roast or two, these leftovers should not be given to our pets. This type of food has a high fat content and can cause pancreatitis to develop. Don’t forget to keep onions and garlic away from our furry family members! Chewing gum and sugar free lollies are toxic to our pets, even if they have a small amount. This is because they include Xylitol which is an artificial sweetener. It is important that you remember all the above hazards and contact your vet clinic or closest pet emergency hospital if you notice any of the above symptoms in your pet. Now we can await the Easter bunny’s arrival and enjoy the chocolatey goodness. Calories don’t count on public holidays, right?